There are currently 183 people online. OCZ introduced the ZT series, a new line of modular power supplies with wattages of 550W, 650W and 750W. These units have a single +12V rail and offer 80Plus Bronze certification. Cooling is provided by a 140mm fan. OCZ Technology Group, Inc., (Nasdaq:OCZ) a leading provider of high-performance solid-state drives (SSDs) and power management solutions for computing devices and systems, today unveiled the ZT Power Supply Series which offers consumers performance and stability for gaming systems and desktops. Providing high efficiency, cool operation, and a fully modular cable design, the ZT Series comes in a range of wattage options for users looking for a quality upgrade. Together with the PC Power & Cooling design team, OCZ developed the all-new ZT Series to remain rock-solid and stable even under intensive multitasking and gaming environments. With a 100% modular cable management system, the ZT Series improves airflow and eliminates unnecessary wire clutter inside computer desktop chassis. Kept supremely cool with a variable load and temperature controlled 140mm fan, ZT power supplies are engineered to limit distracting noise from your PC when working or gaming. Furthermore, the 80-Plus Bronze certified ZT Series features up to 85% efficiency under typical load environments and complies with the ErP (Energy-related Products) Directive to ensure less than one watt of power is used in passive standby and off modes. The OCZ ZT Series will be available in 550W, 650W, and 750W models, and comes backed with a leading 5-year OCZ PowerSwap Warranty for unparalleled peace of mind. 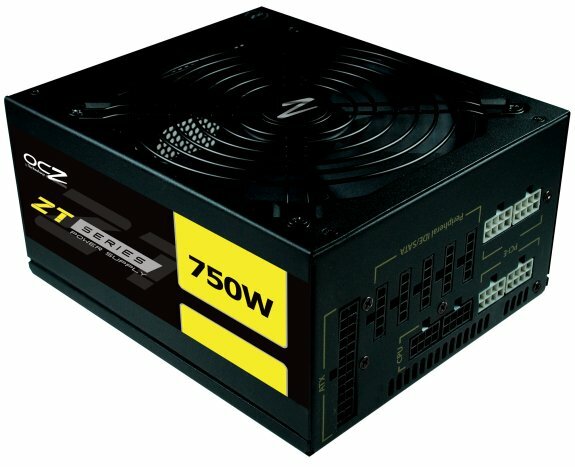 The ZT PSU Series will be available worldwide with an MSRP of $99.99, $109.99, and $119.99 respectively.